Brazil’s “Piripkura” has won the Amsterdam Human Rights Award at this year’s International Documentary Film Festival Amsterdam (IDFA). Recognition for a devastating chronicle, the award comes with a cash prize of €25,000. The jury said of the film: “With this poignant, exceptional story, the filmmakers tackle a broad series of issues that should be high up on the international human rights agenda. The filmic quality of this documentary left us no choice but to award the Amsterdam Human Rights Award to ‘Piripkura.’”The film was produced by Brazil’s Zeza Filmes with Maria Farinha Filmes and Grifa Filmes as associate producers. Ahead of the International Day of the World’s Indigenous Peoples on 9 August 2017, IPS publishes a statement by Mariam Wallet Aboubakrine (Chairperson of the UN Permanent Forum on Indigenous Issues), Albert K. Barume (chairman of the UN Expert Mechanism on the Rights of Indigenous Peoples) and Victoria Tauli-Corpuz (Special Rapporteur on the rights of indigenous peoples). The group of experts warns that he world’s indigenous peoples still face huge challenges a decade after the adoption of an historic declaration on their rights. The killing of environmental defenders has been the topic of several recent reports (see e.g. https://humanrightsdefenders.blog/2017/07/15/documenting-the-killings-of-environmental-defenders-guardian-and-global-witness/). 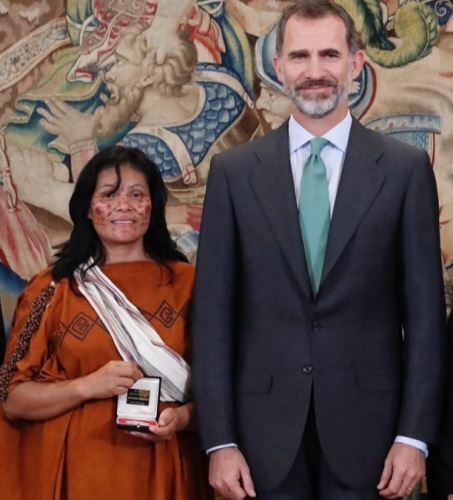 The Bartolome de las Casas Prize – which deserve to be better known than it is – was established in 1991 to recognize outstanding contributions and leadership in promoting rights and values of indigenous peoples. The award was named after Fray Bartolome de las Casas, as he became noted for his defense of native peoples’ rights. 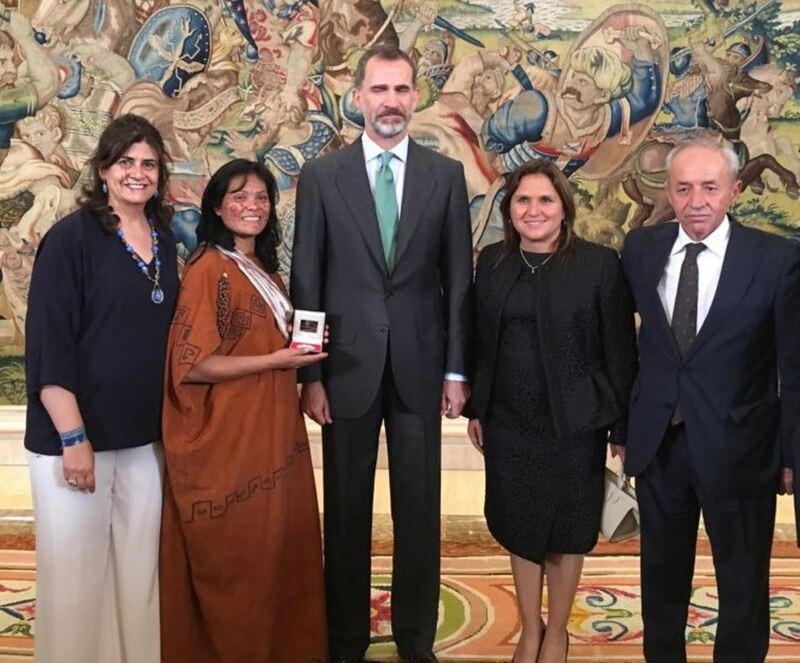 Granted already in 2014, King Felipe VI of Spain presented the 23rd Bartolome de las Casas Award on Tuesday 4 July to Ruth Buendia, for her leadership skills as chairwoman of the Central Ashaninka del Rio Ene (CARE), a local organization in Peru that gathers 17 indigenous communities and works to defend the rights of the Ashaninka people in the Ene River Valley.the award honors her significant contribution to human and sustainable development, as well as her environmental protection work. The jury acknowledged Buendia’s efforts to provide access to public health and education services across the communities. Also, she managed to stop the construction of the Patizipatango hydroelectric dam, which prevented arable lands of 10 communities from being flooded. The Bartolome de las Casas Award was also granted to Colombia‘s Fundacion Caminos de Identidad —FUCAI (Roads to Identity Foundation) for its constant work strengthening identity and autonomy of indigenous peoples in different fields: education, food sovereignty, family, childhood and youth. Protesters – or (human rights) defenders? Land Protectors shut down work on the $12 billion Muskrat Falls hydro project in a fight to protect their traditional food and way of life. Photo by Justin Brake.